Ecalpemos: Professor John Searl - or is it? Truthseekers666 from YouTube has made a fantastic series of videos explaining his research into the claims of "Professor" John Searl and the Searl Effect Generator which I have embedded below this post. One issue raised in the YouTube discussion has been Searl's claim to have served in the RAF and having kept his uniform. Initially I was willing to give him the benefit of the doubt as my own dad did national service in the RAF and was told to keep his uniform while he was on the reserve list (which I think ran for six years). However, having come across these photographs I find something odd. 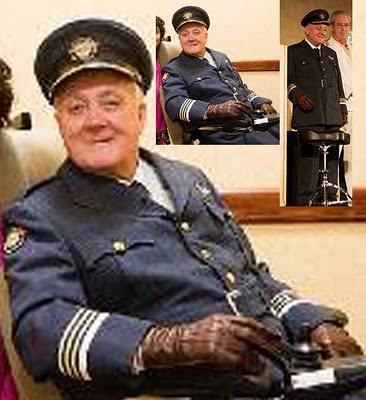 The sleeve insignia (the rings around his cuffs) indicate an Air Chief Marshall, one of the highest ranks in the Royal Air Force, and not something anyone could achieve in two years (the time he claims to have served in the air force). Then on closer inspection I noticed something odd. Those do not appear to be RAF insignia on the hat or shoulder. 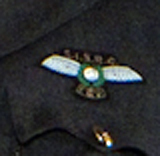 Its hard to say without higher resolution photographs, but I think these are the insignia of his "Swallow Command" organisation. Here are the two images and my enlargement. These are definitely not RAF insignia. More like a child's play suit than a uniform. His title of professor is also unsubstantiated and appears to be self styled like alien contactee George Adamski in the 1950's who had a not dissimilar band of followers. Probably not the last we have heard about this story.